• In refractive cataract surgery, priorities include safety, refractive correction targeting spectacle-free visual function in daytime and nighttime and at all distances, and a fully customized procedure for each patient. • A premium cataract treatment should include premium diagnostics, premium performance in the operating room, and premium IOL implantation. • New technological advances are making surgeons’ refractive cataract surgery goals easier to achieve. Evaluating the optic nerve head (ONH) has long been a vital aspect of detecting and monitoring glaucoma, but the methods of evaluation have evolved. Historically, ONH drawings were the sole record of the optic nerve’s appearance. Since the 1800s, optic disc photography has been considered the gold standard for optic nerve evaluation. Initially, film was used.1 Now, high-resolution stereo digital images can be obtained to record the ONH’s appearance over time. Disc photography offers many advantages over disc drawings, including a more accurate and objective recording. A major disadvantage of photography is its qualitative nature, which makes subtle changes in the disc difficult to detect and renders disc assessment prone to interobserver variability. Additionally, patients generally dislike the pupillary dilation and bright lights required for photographs, although it should be noted that newer digital cameras may not require dilation. The desire for more quantitative, convenient, and comfortable methods of evaluating the optic nerve has led to the development of various imaging techniques. Figure 1. 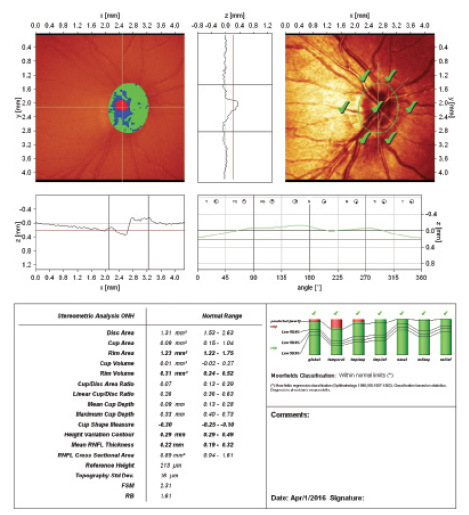 This portion of the HRT printout shows the optic nerve parameters measured and Moorfields Regression Analysis. Computer-assisted imaging, including confocal scanning laser ophthalmoscopy (CSLO; Heidelberg Retinal Tomograph [HRT; Heidelberg Engineering]) and optical coherence tomography (OCT) have emerged as popular methods for assessing the optic nerve. The HRT uses a laser to create a 3-D image of the optic nerve. Parameters measured include area and volume of the disc, disc rim, cup depth, and the cup-to-disc ratio (Figure 1). These parameters are compared to a normative database using the Moorfields Regression Analysis to detect glaucoma and can be monitored for glaucomatous progression.2 Newer software such as the Glaucoma Probability Score are not dependent on manual outlining of the optic disc margin2 and may be more accurate than prior HRT software. OCT measures the thickness of the retinal nerve fiber layer (RNFL) using reflected light and the principle of interferometry. Depending on the precise light used, OCT devices are classified as either time domain or spectral (also known as Fourier) domain. In addition to the analysis of RNFL parameters, OCT provides data regarding the optic disc and rim area, average and vertical cup-to-disc ratio, and cup volume (Figure 2). Similar to the HRT, progression analysis software of the OCT devices is based on a comparative database. Figure 2. This portion of the OCT printout shows the optic nerve parameters measured. It is critical for the clinician to use ONH imaging in conjunction with the clinical examination and visual field testing. A “normal” imaging test may be as informative as—or possibly more so than—an “abnormal” test. For instance, in a study comparing spectral-domain OCT, standard automated perimetry, and stereo photography, most eyes with detectable disease progression were identified with only one testing method (low positive predictive ability). Interestingly, there was a large amount of agreement among all three methods for eyes in which glaucoma was not progressing (high negative predictive ability).18 Although possible disease progression as detected by one method may not warrant escalating treatment, the lack of progression, as determined by several methods, may allow clinicians to confidently continue their current treatment course. 1. Pashby RC, MacDonald RK. Photographic assessment of the optic disc. Can J Ophthalmol. 1975;10(2):286-289. 2. Harizman N, Zelefsky JR, Ilitchev E, et al. Detection of glaucoma using operator-dependent versus operator-independent classification in the Heidelberg Retinal Tomograph-III. Br J Ophthalmol. 2006;90(11):1390-1392. 3. Greenfield DS, Weinreb RN. Role of optic nerve imaging in glaucoma clinical practice and clinical trials. Am J Ophthalmol. 2008;145(4):598-603. 4. Kass MA, Heuer DK, Higginbotham EJ, et al. The Ocular Hypertension Treatment Study: a randomized trial determines that topical ocular hypotensive medication delays or prevents the onset of primary open-angle glaucoma. Arch Ophthalmol. 2002;120(6):701-713; discussion 829-830. 5. Tatham AJ, Medeiros FA, Zangwill LM, Weinreb RN. 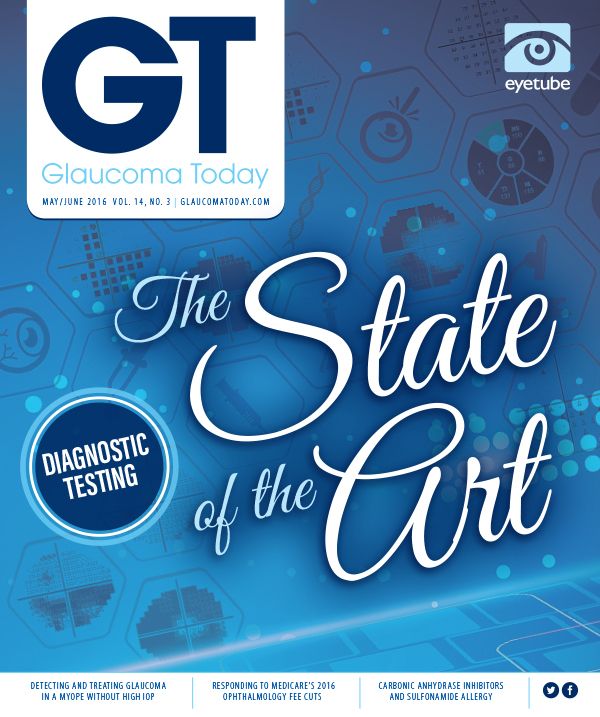 Strategies to improve early diagnosis in glaucoma. Prog Brain Res. 2015;221:103-133. 6. Zangwill LM, Weinreb RN, Beiser JA, et al. Baseline topographic optic disc measurements are associated with the development of primary open-angle glaucoma: the Confocal Scanning Laser Ophthalmoscopy Ancillary Study to the Ocular Hypertension Treatment Study. Arch Ophthalmol. 2005;123(9):1188-1197. 7. Sung KR, Na JH, Lee Y. Glaucoma diagnostic capabilities of optic nerve head parameters as determined by Cirrus HD optical coherence tomography. J Glaucoma. 2012;21(7):498-504. 8. Begum VU, Addepalli UK, Yadav RK, et al. Ganglion cell-inner plexiform layer thickness of high definition optical coherence tomography in perimetric and preperimetric glaucoma. Invest Ophthalmol Vis Sci. 2014;55(8):4768-4775. 9. Chauhan BC, Nicolela MT, Artes PH. Incidence and rates of visual field progression after longitudinally measured optic disc change in glaucoma. Ophthalmology. 2009;116(11):2110-2118. 10. Danias J, Serle J. Can visual field progression be predicted by confocal scanning laser ophthalmoscopic imaging of the optic nerve head in glaucoma? (An American Ophthalmological Society Thesis). Trans Am Ophthalmol Soc. 2015;113:T41-410. 11. Riga F, Georgalas I, Tsikripis P, Papaconstantinou D. Comparison study of OCT, HRT and VF findings among normal controls and patients with pseudoexfoliation, with or without increased IOP. Clin Ophthalmol Auckl NZ. 2014;8:2441-2447. 12. Wu H, de Boer JF, Chen L, Chen TC. Correlation of localized glaucomatous visual field defects and spectral domain optical coherence tomography retinal nerve fiber layer thinning using a modified structure-function map for OCT. Eye Lond Engl. 2015;29(4):525-533. 13. Hornova J, Kuntz Navarro JBV, Prasad A, et al. Correlation of disc damage likelihood scale, visual field, and Heidelberg Retina Tomograph II in patients with glaucoma. Eur J Ophthalmol. 2008;18(5):739-747. 14. Monteiro MLR, Costa-Cunha LVF, Cunha LP, Malta RFS. Correlation between macular and retinal nerve fibre layer Fourier-domain OCT measurements and visual field loss in chiasmal compression. Eye Lond Engl. 2010;24(8):1382-1390. 15. Medeiros FA, Lisboa R, Zangwill LM, et al. Evaluation of progressive neuroretinal rim loss as a surrogate end point for development of visual field loss in glaucoma. Ophthalmology. 2014;121(1):100-109. 16. Medeiros FA, Zangwill LM, Bowd C, et al. Influence of disease severity and optic disc size on the diagnostic performance of imaging instruments in glaucoma. Invest Ophthalmol Vis Sci. 2006;47(3):1008-1015. 17. Leite MT, Zangwill LM, Weinreb RN, et al. Effect of disease severity on the performance of Cirrus spectral-domain OCT for glaucoma diagnosis. Invest Ophthalmol Vis Sci. 2010;51(8):4104-4109. 18. Banegas SA, Antón A, Morilla-Grasa A, et al. Agreement among spectral-domain optical coherence tomography, standard automated perimetry, and stereophotography in the detection of glaucoma progression. Invest Ophthalmol Vis Sci. 2015;56(2):1253-1260.